Manzanita – What the heck is it? › Who We Are › Our Blog › Manzanita – What the heck is it? Manzanita is perhaps the fastest growing plant based product used in commercial holiday and seasonal decorating industry. Latin name: Arctostaphylos columbiana manzanita is a wood like product that grows in vine-like segments allowing them to be beautifully and artistsicially woven together to form shapes small and large. 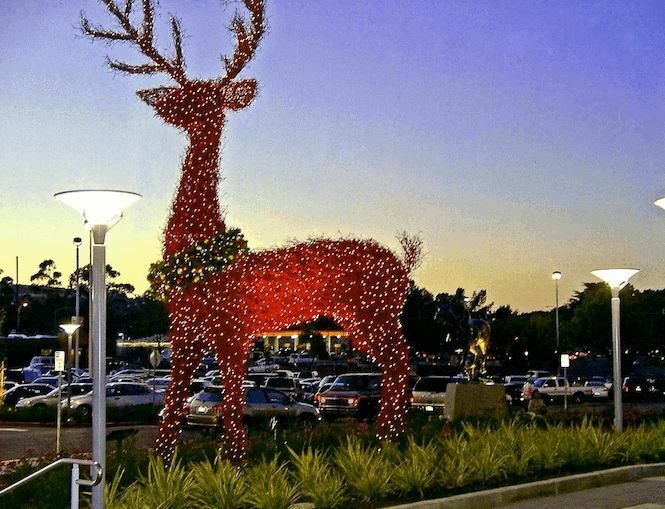 Pictured above - you will see a giant 12' manzanita reindeer. Available in myriads of colors - manzanita is trending! 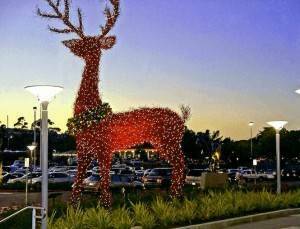 You will see it featured usually in the form of reindeer, sleighs, oversize presents, snowmen, and so on. Often situated at entrances and exits, manzanita is favored for its incredible durability and vibrant exterior applications. Manzanita is now making its way inside. You will be seeing over sized figurines in interior walkways, common areas, food courts, lobbies, and atriums - they are stunning and make an instant conversation pieces. Look out for Manzanita making its decorating debut at retail centers and holiday event venues near you.